This was one of those days, where we went about everything in random order and yet it all still worked somehow. Which is encouraging. Here's how it went. 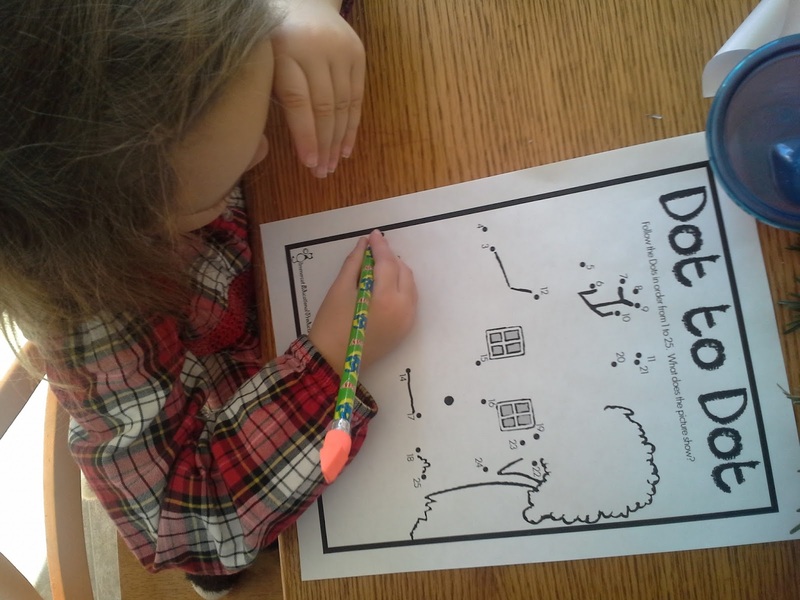 I'm working away on the computer, completing a Dot to Dot for the letter W, when there is a little hand on my knee and a little voice says, "I want a Dot to Dot." What's a mom to do, but print out that H Dot to Dot page, even though we haven't introduced H yet? Teaching Tip: Child-Led learning is the best learning there is. Don't miss that opportunity when your little one expresses their interest, even if it doesn't quite fit with your schedule or plan. Yep. 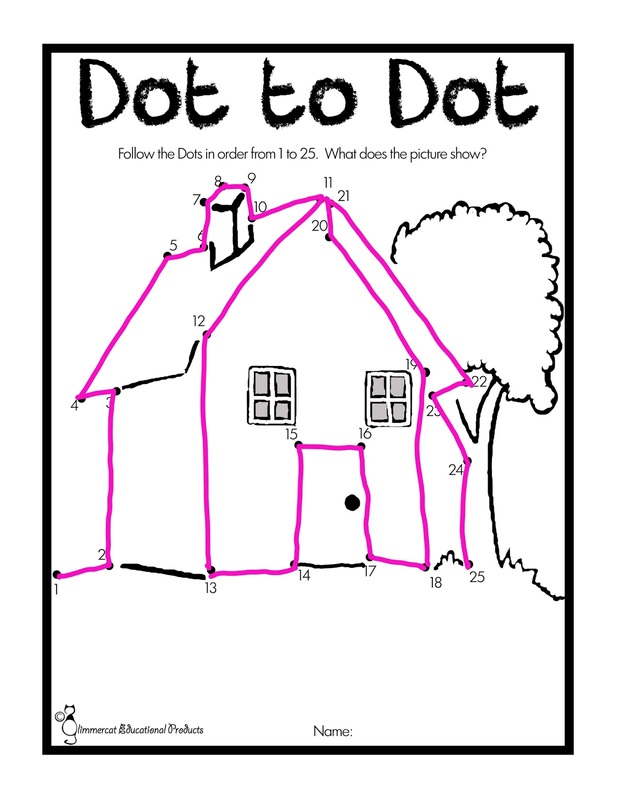 Looks like a Winnie the Pooh house to me! So, here is where we began. And then we went back and filled in the pieces. Little Miss is very familiar with Glimmercat these days. She refers to the kitty character as "my Glimmercat" in the same way that she refers to Hello Kitty toys as "My No-Kitty". 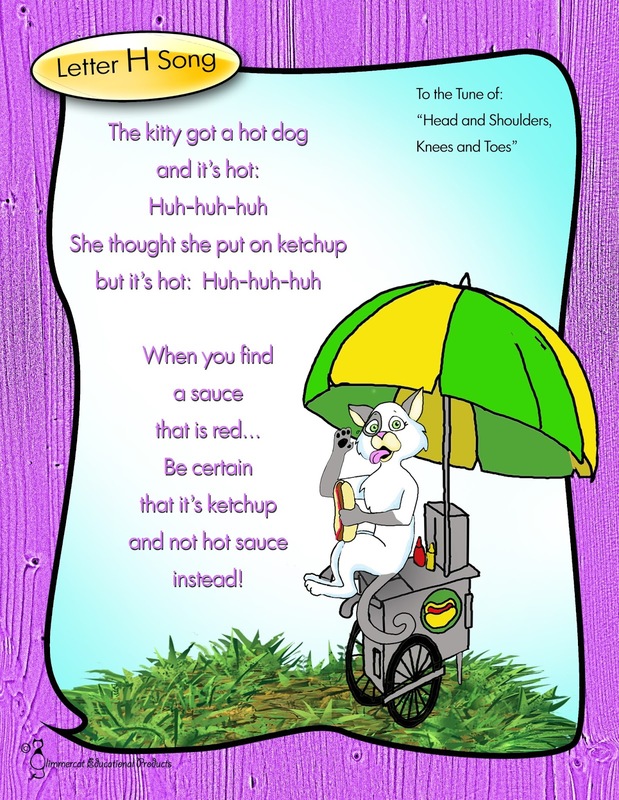 So, we pulled out our Glimmercat Song for H because it is fun and my son sang it along with us. Like all the letter sounds, even though I write out the "H" sound as "huh", we keep it short and poppy so it is more of the sound than the word "huh". 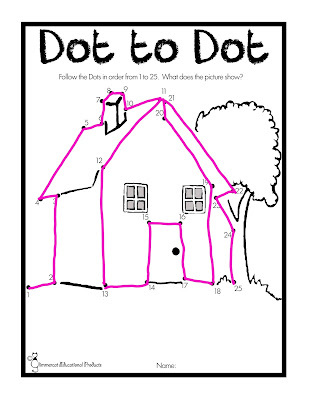 This helps later when they move into learning to read with sounds. 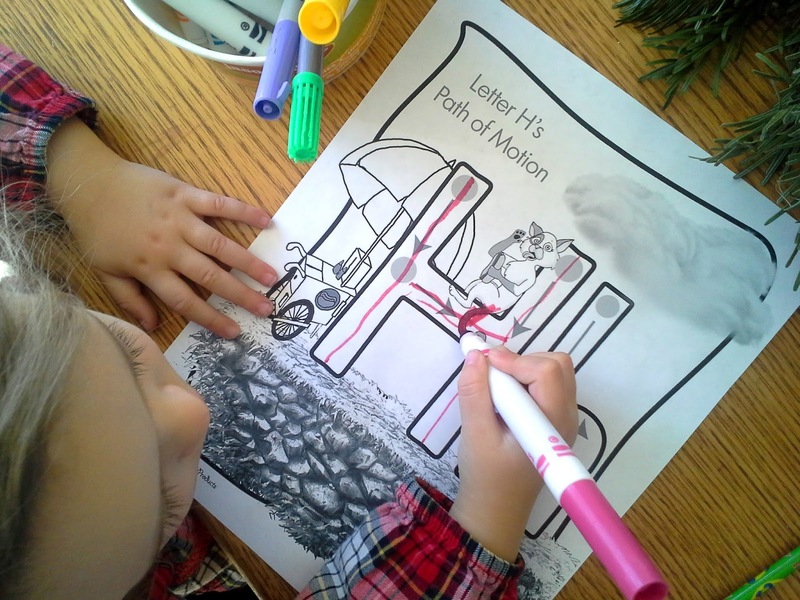 Then, I printed out the Path of Motion for H. I always print out the black and white version, even though the color one looks so nice, because Little Miss loves to color her Glimmercat. 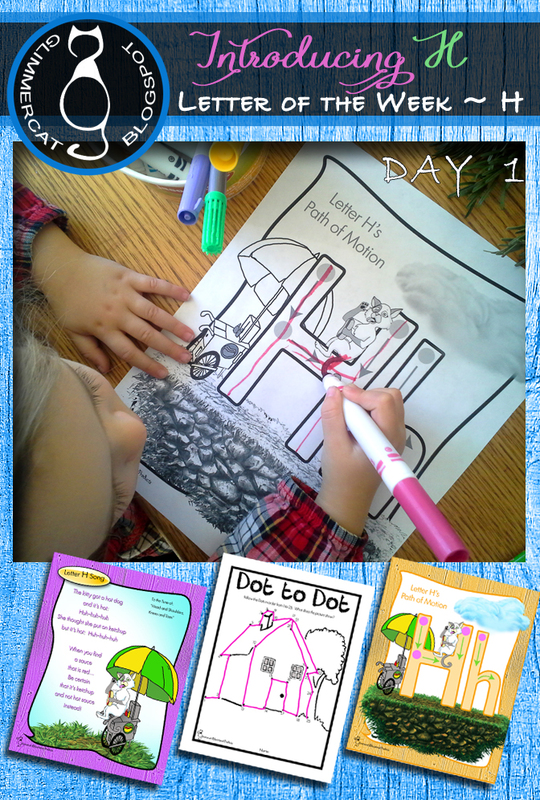 Now, we went over the Big H and the little h a couple of times with our fingers, and she wanted a marker. 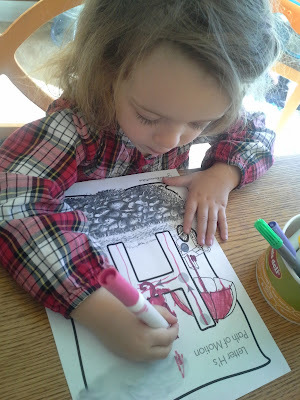 I assumed she just wanted to color, but I look over, and there she is, writing in the Big H, practicing how to write it! Yay, Little Miss! Then she colored in more with her trusty pink marker. It was a backwards sort of introduction to the letter H, but you know what? It worked! And that is what matters.